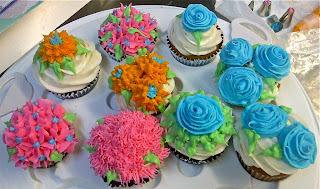 After three classes, the Piggys now know how to pipe a couple of different patterns, ice a cake, decorate it, and pipe an assortment of flowers, yay! 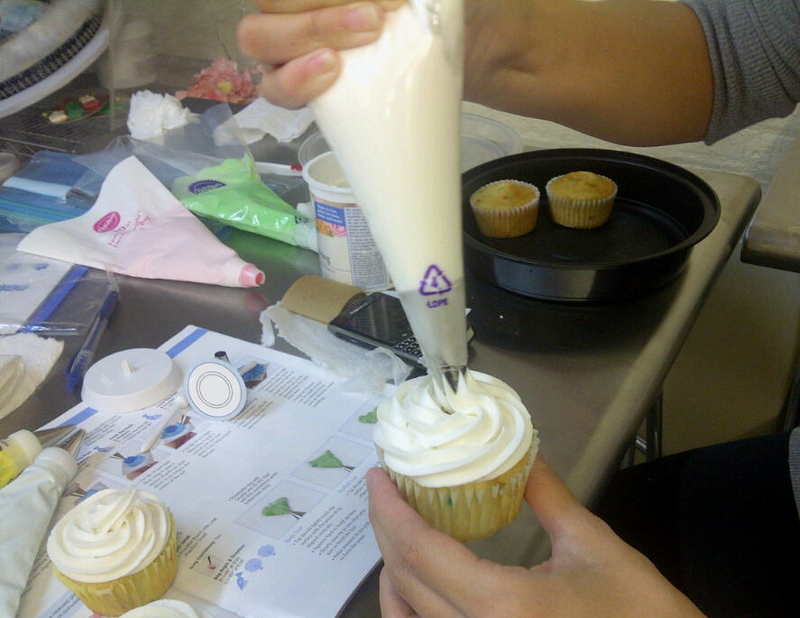 For our last class, we brought in cupcakes to decorate (thank goodness these came out soo much better than our cakes last week - no unfortunate craters or [pan]cakes this time)! 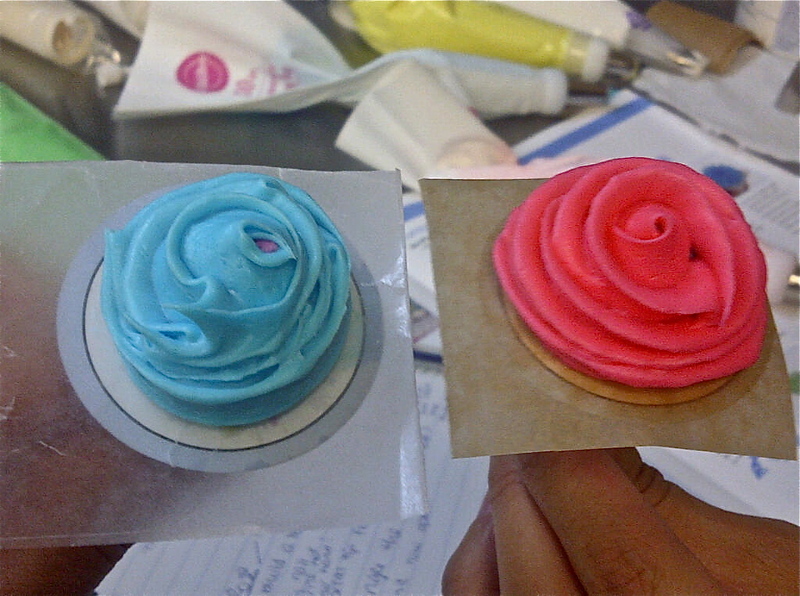 We prepared a couple of different colors of icing and were ready to go. 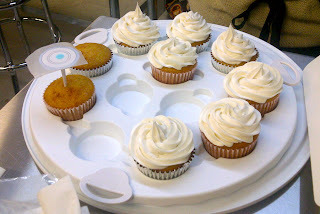 First things first, we learned how to pipe icing onto our cupcakes in a swirled motion. Then we jumped right into learning how to make flowers! 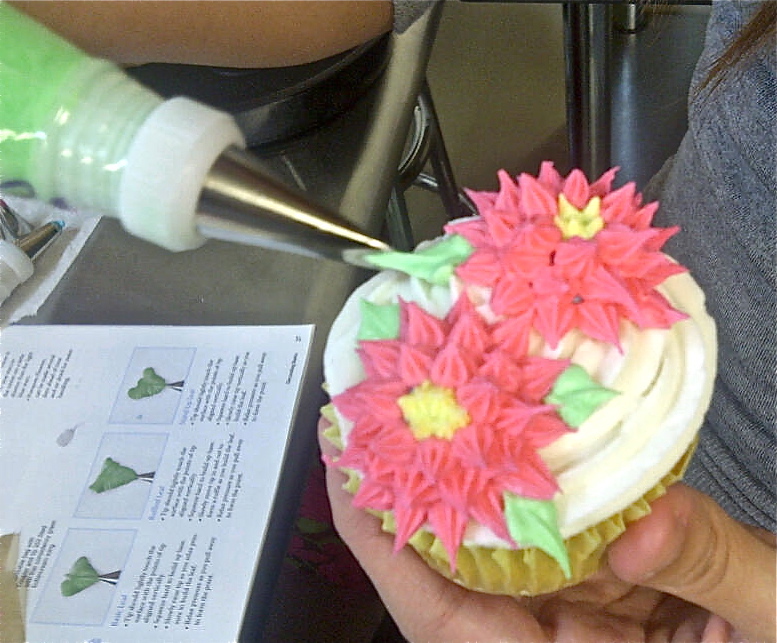 We prepared our flower nails (came with our Student Kits and makes piping flowers easier for us beginners). See the Flower Nail sitting pretty on the cupcake? Piggy KK had a bunch of lovely swirled cupcakes. Shaggy mums! So fun to make! Just when we were starting to feel confident, we attempted to make roses. 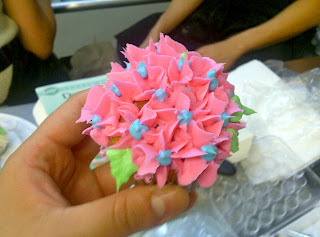 I was most excited to learn how to make this flower - afterall you see it on all the cakes in the bakery! However these wound up being the hardest flower of the morning, and even though our beginner roses came our slightly mutated they were still so pretty! We piped a base, then using a petal tip, piped the middle bud and added rose petals around, row by row. And there you have it! A rose!! Believe it or not, we're not done yet! We also learned how to make Drop Flowers which are pretty easy as there were no base or delicate petals involved. (Phew, redeeming break after those roses!). We simply piped these directly onto the cupcakes and accented them with a little dot in the middle to make a 'bud'. Look at Piggy KK's Drop Flower bouquet! And just like that, here we are as graduates of Cake Decorating 1. 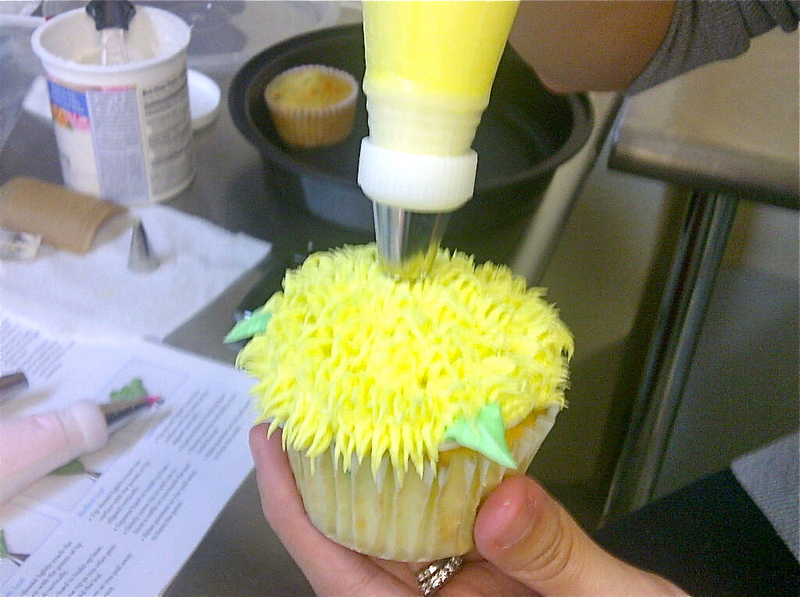 The Piggys loved the class and are eagerly waiting for Cake Decorating 2 in 2012. In the meantime I'm sure we'll be putting our new skills to use with the holiday season coming up, so stay tuned!